Dr. Martin Luther King, that great civil rights lion and beloved the world over for standing up for the downtrodden and the disenfranchised would today have his honor stripped from him and ridiculed in the circles of enlightenment for telling a young black teen that he could change his homosexual desires. In California and New Jersey he might even be arrested. 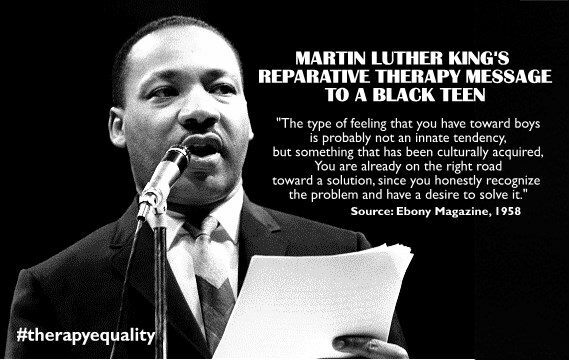 Standing up for therapy equality —whether it takes on the form of religious pastoral counseling or nonreligious therapy— is something Dr. King would be leading the charge on today. VoV adamantly believes it should remain a protected right and option for ALL Americans. This entry was posted in Therapy Equality, Uncategorized and tagged African American, California, Dr Martin Luther King Jr, New Jersey on 2014-08-13 by VoV Contributor.